The horror of animal experimentation is compounded by the secrecy that surrounds it. However, recent statements from the animal research community about developing more open policies have a hollow ring, given their decision to reject CCTV monitoring of experiments and allowing the retention of Section 24 of the Animals Scientific Procedures Act (ASPA) 1986 – the secrecy clause. Click here to donate now and help us to campaign for openness in Britain’s labs. We have heard this before, with the animal experimenters’ spin on openness being more about justifying what they do than actually unlocking the labs. This is public relations and not transparency. It cannot replace independent scrutiny and open assessment of experiments before they take place. 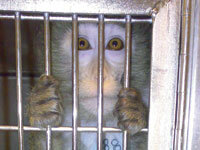 The incorporation of EU Directive 2010/63 into UK law should be an opportunity to increase transparency on vivisection. Yet, where were the cries for openness from the laboratories as the Home Office announced Section 24 would be retained and dealt with later? S.24 makes release of information from labs an offence and has stifled public debate and scrutiny for 25 years. It flies in the face of the UK’s Freedom of Information Act 2000, and the thrust of the European Directive. In an attempt to encourage greater independent scrutiny in animal laboratories, NAVS and Animal Aid requested that CCTV be installed. We cited specific cases from NAVS investigations showing how this could have helped the Home Office inspectorate identify abuses. In September this year, the Home Office rejected the proposals saying they “do not have the legal powers to require the placing of CCTV cameras in animal research establishments at the present time and…do not consider it likely that such powers would be granted”. Agreement on CCTV would need to be reached with industry, and it is disappointing that the Home Office has not put more effort into persuading them of the necessity of ongoing monitoring. Pressure needs to be applied at ministerial level and we will continue to press for CCTV coverage. It seems, despite their latest claims of “openness”, the laboratories are not about to support such proposals either. This contrasts the supermarkets who insisted on introducing CCTV in slaughterhouses after abuses were exposed by Animal Aid. For now, vivisection in Britain is as secret as ever.